I love shots like this. Life from between the ears! 1. You and Ellsworth are riding out alone. Ok, maybe Ryan is somewhere in the vicinity on foot. 2. I don’t recognize that stretch of road so you’re a good distance from home. 3. Ellsworth is alert but confident. 4. You’re taking pictures, so you’re obviously confident. 5. I think you’re both ready for a group trail ride. 6. Lucy and I don’t have any plans for the weekend yet. Ellsworth – I love you…. Did you notice that Carson and Lucy don’t have any plans for the weekend? So glad all of this has come together for both of you! LOL @ Cathy R ! Does Ellesworth have a date with Lucy this weekend? Now this made me smile. Come to think of it….I smile a lot when I visit here. How’s everyone doing, btw? Lovely view from up there…..good for you and Big Red. 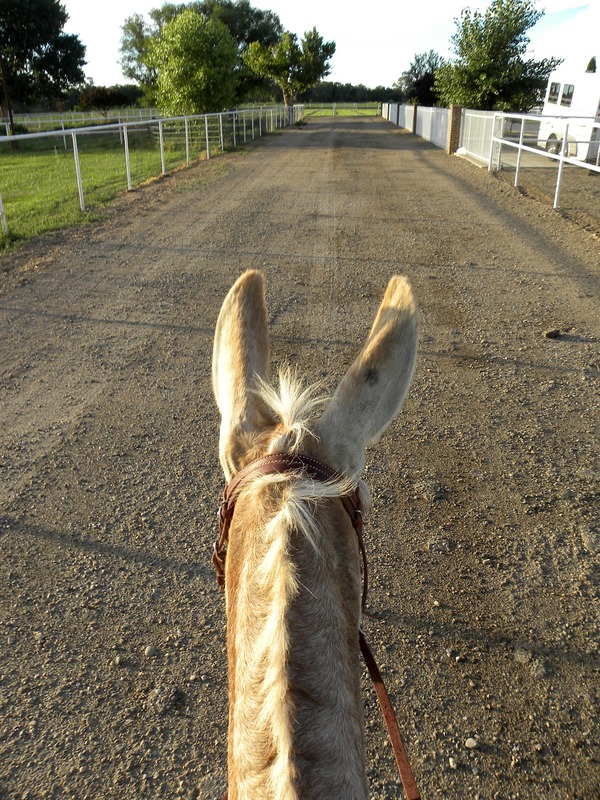 Loved seeing the view from the back of Big Red! You must be over the moon to finally be riding him. Happy, happy trails to you both!! And we could totally swing up (up?!) and pick up Carolynn on the way. A trio of photographers and assistants is a great thing, right? Well, howdy there pardner! Looks like fun! Obviously, I won’t be riding my li’l girls but I still haven’t given up on training them to cart — why not, I say! Love the view! Sounds you both will have a great ride. Have a nice weekend, whatever the plans are!